On Wednesday, 4 October 2017, Al Mezan Center for Human Rights concluded a three-day training course entitled “A Right and a Duty—Elections as a Way to Reclaiming Legitimacy”. The training, held at Roots Hotel, was delivered to the 2017 volunteers of Al Mezan’s “Pass the Word” program. Pass the Word is part of Al Mezan’s initiative to enhance public awareness about elections and electoral processes. 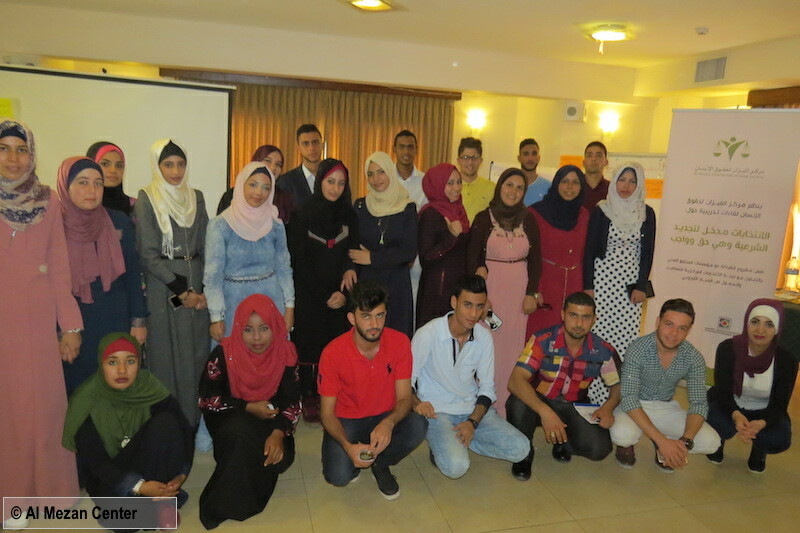 The training was commissioned by the Central Elections Commission – Palestine, and is a component of the project, “Electoral Awareness Support in Partnership with CSOs”, funded by the European Union. The training introduced seminal concepts of human rights, democracy and the underlying principles and obligations of the relevant International Convention on Civil and Political Rights. It also provided students with an in-depth understanding of elections—their procedures, regulations, significance and observation methods, as outlined in Palestinian and international human rights law.